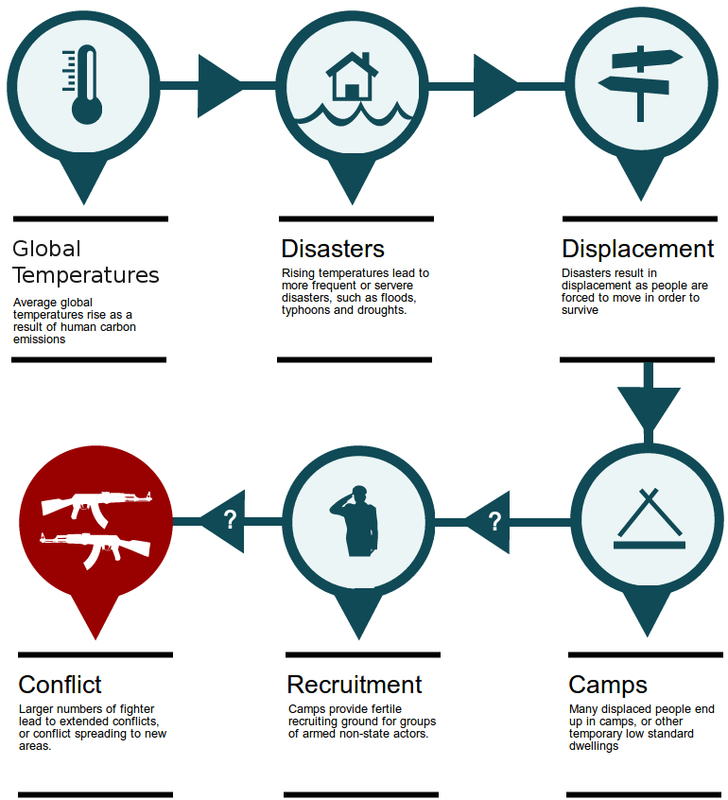 Infographic: how are climate change and conflict linked? 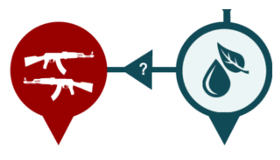 Several theories link climate change to armed conflict. But how do they stack up against the evidence? 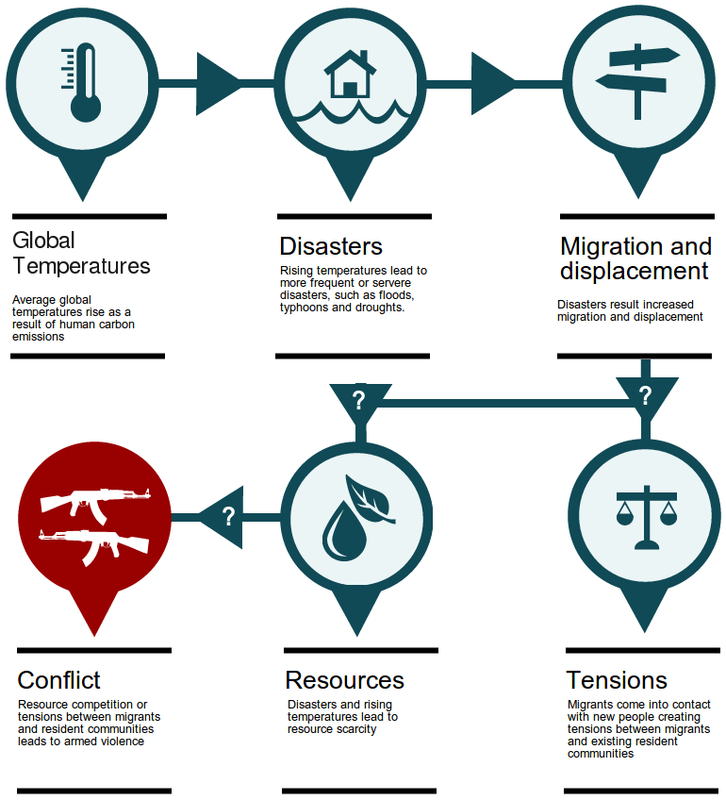 There is evidence that climate change can extend or increase existing conflict, however there are several competing theories about exactly how this happens. We put the theories to the test. There is certainly a strong connection between climate change and depletion of many natural resources, especially water and growing land. However, this theory sees a relatively simple connection between resource depletion and conflict. Scarce resources do not always lead to armed conflict. There are many examples where scarcity is managed peacefully. There is good evidence that disasters can lead to migration and displacement. Depending on the disaster, in some cases millions of people can end up moving temporarily or permanently. However there is little evidence that migrants create tensions in their new locations, or that new arrivals compete with existing communities over resources. Where these tensions do exist there is little evidence that they result in armed violence. 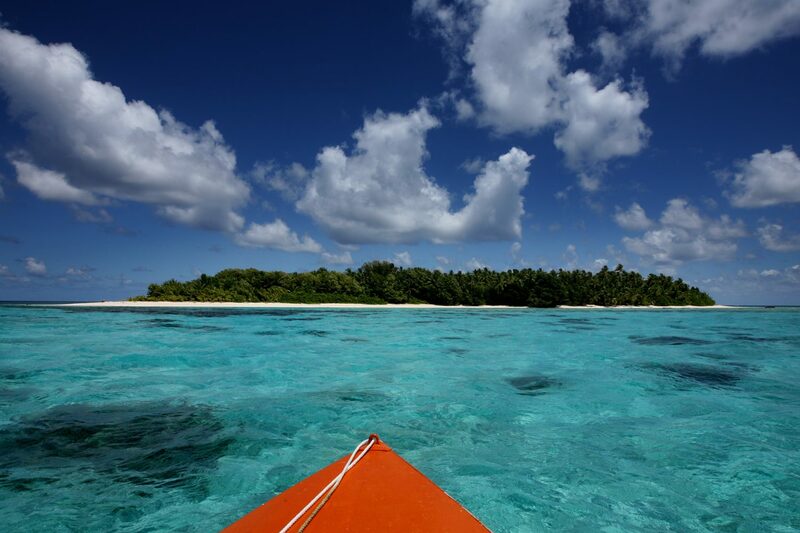 There is evidence linking climate change, disasters and displacement. It is also true that after disasters many people are forced into camps. In general it is not the case that rebel groups recruit in refugee camps. There are a few notable example, however in the vast majority of camps this is not the case. There is little evidence that the presence of disaster displacees is a primary driver of conflict contagion – where a conflict spreads from one region to another. While there is evidence that climate change can exacerbate conflict, it is still unclear exactly how one causes the other. It may not be possible to describe a causal mechanism that is true in every case. Rather different mechanisms will operate in different situations and locations.